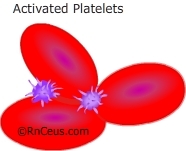 Platelets are cell fragments formed in the bone marrow that circulate throughout the bloodstream. Platelets are a critical part of the body's ability to help blood clot. When blood vessels break, platelets form plugs that prevent further blood loss while healing takes place. Platelets live for approximately nine to 12 days in the bloodstream. A normal platelet count ranges between 150,000 and 350,000. Thrombocytopenia occurs when the platelet count drops below 50,000. A thrombocytopenic patient is at high risk for bleeding if he or she has an injury or a complicating condition that affects blood coagulation, such as hemophilia or liver disease. When the platelet count drops below 20,000, the patient may have spontaneous bleeding that may result in death. Thrombocytopenia occurs due to platelet destruction or impaired platelet production. In thrombotic thrombocytopenic purpura and disseminated intravascular coagulation, platelets are used up rapidly, and the platelet count falls significantly. Immune-related thrombocytopenic purpura, a condition that may occur early in HIV disease, may result in platelet destruction. In this situation, the HIV patient develops antibodies that attach to platelets as though they were an invading organism. When the damaged platelets circulate through the spleen, the attached antibody destroys them. When the bone marrow is suppressed due to radiation, chemotherapy, or other drugs that damage the bone marrow, production of new platelets is impaired. Malignancies of the bone marrow, such as leukemia, often cause the bone marrow to produce so many white blood cells that platelet production drops. A patient with a platelet count of less than 20,000 is at high risk for spontaneous bleeding. Treatment for thrombocytopenia involves treating the disease condition that is affecting platelet production or causing platelet destruction. Patients with thrombocytopenia may also receive platelet transfusions when the platelet count is dangerously low. Thrombocytosis, an increased platelet counts, is most often caused by a reaction to injury or inflammation.